Congrats Ashley we will be in touch via mail. 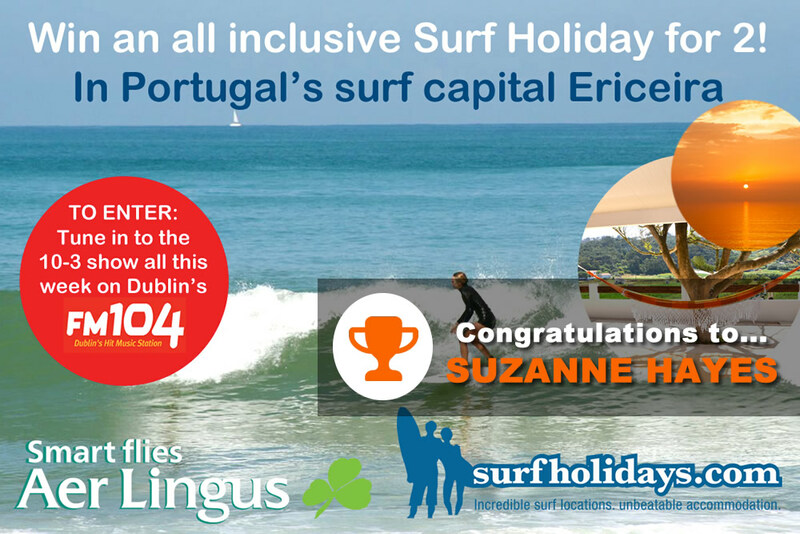 Were also giving 10 runners a €50 voucher for their next Surfholiday. The winners are below. 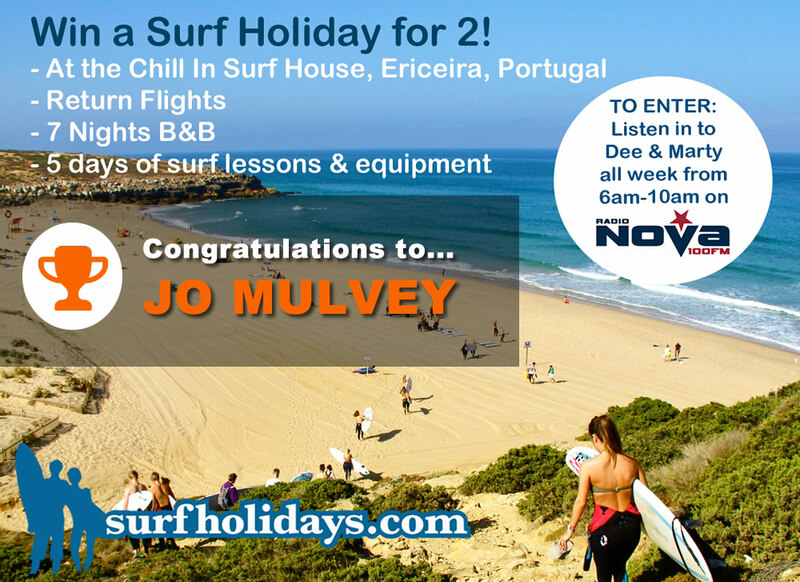 To be in with a chance of winning this once in a lifetime trip to Portugal for you and a mate, you have to ‘Like’ the Surfholidays.com Facebook page and enter via Surfholidays.com. 1) Like the Surfholidays.com Facebook page. 3) Travel is subject to dates available and does not include the months of July/August. 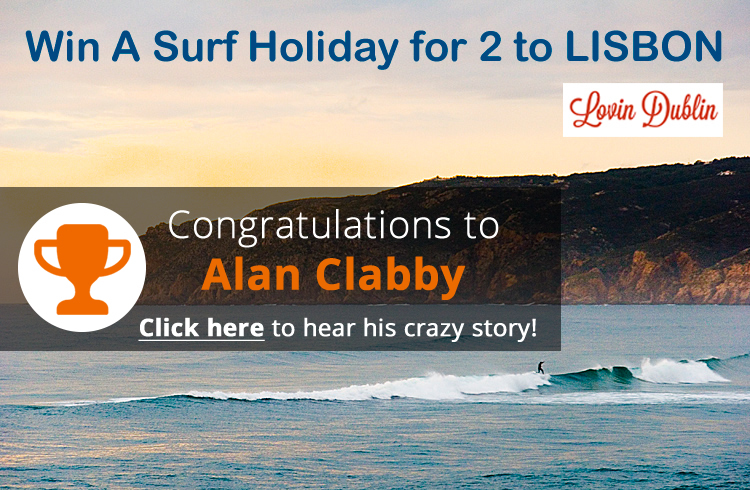 4) Winner be announced on the Surfholidays.com Facebook page on June 15th 2015 at 5pm. 6) An entrant and their selected travelling companion must both be over 18 years of age on the date of entry in order to be eligible for this promotion. Entrants must provide proof of age and/or residence if requested. The prizes awarded under this promotion permit the winner to share the prize with one nominated guest. The determination of residence and qualification for entry to the promotion shall be at Surfholidays.com sole discretion. 7) No purchase of any product is necessary to enter the promotion. 8) The end date for this promotion is June 15th 2015. Surfholidays.com accepts no responsibility for entries not received. 9) The winner will be contacted via email. Should any of the entrants be unavailable or unable to be contacted, Surfholidays.com may at its discretion choose a replacement winner to contact without further reference to the entrant originally drawn. 10) Winners may be required to agree to additional terms and conditions communicated to them by Surfholidays.com. 11) The prize is not transferable or for sale or resale or redeemable for cash and can only be used by the winner. No cash alternative is available. 12) By accepting their prizes, the winners grant (and shall procure that their nominated guest grant) Surfholidays.com the right to use and publish their names and pictures in such media as Surfholidays.com may choose for advertising and/or promotional purposes. If requested by Surfholidays.com prize winners must agree to take part in any publicity regarding their prize. 13) No warranty or guarantee is given by Surfholidays.com in relation to the prizes. Surfholidays.com shall not be liable or responsible for any loss, liability, damage or injury suffered or sustained to person or property (including, but not limited to, consequential loss) by reason of any act or omission by Surfholidays.com or its servants or agents in connection with the supply of any goods or services by any person to the prize winners and their nominated guests or by reason of an entrant or prize winner otherwise participating in this promotion. 14) No responsibility will be accepted by Surfholidays.com for failed, partial or garbled computer transmissions, for any computer, telephone, cable, network, electronic or internet hardware or software malfunctions, failures, connections, availability, for the acts or omissions of any service provider, internet, accessibility or availability or for traffic congestion or unauthorised human act. 15) Surfholidays.com accepts no liability for any changes in travel arrangements due to weather/public strike or circumstances out of Surfholidays.com control. 16) Entering the promotion shall be deemed to be a full and unconditional acceptance of the terms and conditions of this promotion. A failure to adhere to these terms and conditions shall result in disqualification from the promotion and, if necessary, forfeiture of a prize. Surfholidays.com reserves the right to suspend, cancel or withdraw this promotion, or amend the terms and conditions of this promotion, in whole or in part at any time. 17) Surfholidays.com may use your email address is various marketing campaigns including newslettter. 18) The promotion and these terms and conditions in relation to the promotion will be governed by Irish law and subject to the exclusive jurisdiction of the Irish courts.